The Carthusian pink bears little relation to the grey-leaved alpine pinks or showy, highly bred garden pinks we all know or recognise, although it is a member of the same family. 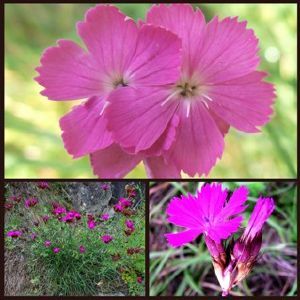 The grass-like mounds of fine green leaves, the tall straight stems and the small, flat-headed clusters of seven or eight single flowers found on Dianthus carthusianorum are more reminiscent of another member of the dianthus family, the Sweet William (Dianthus barbatus). The Carthusian Pink is found growing wild on dry limestone hillsides in southern, central and western Europe. It is named after the Carthusian order of monks, founded in 1084, who originally came from Grande Chartreuse near Grenoble. Each monk had his own small garden and, as the order spread through Europe, so did the pink. It was introduced into Britain in 16th century but has never been widely grown. This is changing, however. Its elegant habit, upright stance and simplicity are well-suited to modern planting styles and the need to provide more pollinator plants. It has the same see-through quality as the popular Verbena bonariensis. As with all pinks Dianthus carthusionorum needs well-drained soil and an open, sunny situation. Pinks also demand clean air, which can make them difficult to grow in urban gardens - seaside gardens and those with poor soil, however, suit them very well. Uses: Looks great planted amongst ornamental grasses, planted in gravel gardens or planted in more ‘wild’ effect gardens. Another great plant to attract bees and butterflies into the garden and if content will naturalise moderately.